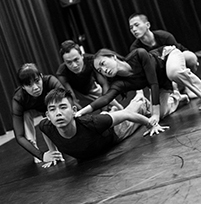 Expressions Dance Company (EDC) and Hong Kong’s City Contemporary Dance Company (CCDC) unite to present the Australian premiere of 4Seasons, a compelling triple bill showcasing stunning new contemporary dance works. Natalie Weir and the EDC dancers are in Hong Kong right now preparing for the premiere of 4Seasons at the Ko Shan Theatre on 1-3 June before returning to Brisbane with the CCDC (Hong Kong) dancers to perform in the QPAC Playhouse season, 14 – 22 June. Then the two companies continue onward to Darwin Entertainment Centre on 29 & 30 June, and then Beijing! This breathtaking triple bill features Vivaldi’s evergreen Baroque masterpiece The Four Seasons, together with other stunning musical works in this powerhouse international performance. These fresh new works created by Natalie Weir (Artistic Director, EDC), Dominic Wong (Assistant Artistic Director, CCDC) and Helpmann Award-winning choreographer Kristina Chan bring together 20 dancers from the EDC and CCDC ensembles for a truly international event showcasing world-class artistry and exhilarating physicality. The triple bill features Day After Day by Dominic Wong, Summer by Kristina Chan and 4Seasons by Natalie Weir. Don’t miss the Australian premiere at QPAC – Book now!